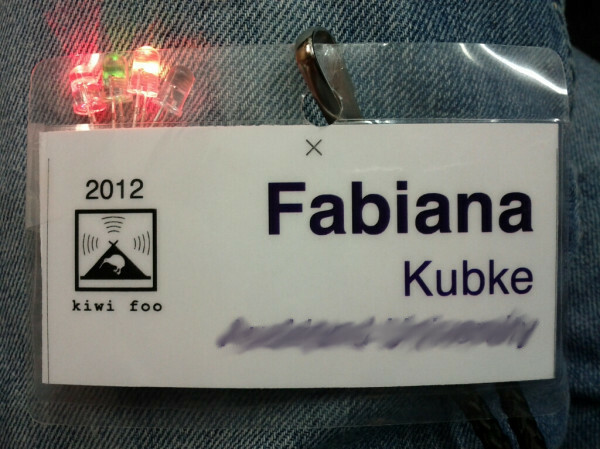 I just came back from another amazing kiwi foo. I have talked about it before, so I will not bore you with the details of what kiwi foo is all about. This time, unlike other years, I went with a very focused view of what I wanted to achieve. And it was as stimulating as ever. Over the past year, I have gone into a rather quiet reflexion of what ‘open science’ is and how to make it work. I have become increasingly frustrated with a model of science that increasingly rewards self-promotion rather than knowledge sharing. And the emerging theme of my reflexion was ‘context’. If we want a ‘global’ open science, the formula for adoption needs to be able to adapt to local personal, institutional, social, political, economical and legislative contexts. I may be wrong, but I think many of us who support open science struggle at times with how to make it work in the particular contexts in which we need to operate. As I was struggling with the frustration of the commodification of science over the past two years, I started thinking about the open source community. I can’t blame universities for encouraging scientists to produce revenue at a time when public funding for education are research appear to be in constant decline. So I went to Webstock a year ago to try to learn more about how open source projects generate revenue. After all, their business models are built around giving their ‘product’ away for free, something that is well aligned with the ethos of science. One of my highlights at kiwi foo was a conversation with Don Christie from CatalystIT, a company that produces high quality open source software. I am looking forward to continuing this conversation and exploring how these business models can be adapted to the different demands and constraints for science. I got a lot of insight from him, and am hoping he and people like him can help us move forward. On the second day (or rather the first long day) there were a few sessions that centered around science. Great things came out of it, and it would be impossible to name everyone that provided insight. Nick Jones, Leonie Hayes, Alex Holcombe , Alison Stringer and I partnered in crime and ran a couple of sessions where we hashed a few issues around. I personally wanted to explore what Open Science meant in the New Zealand / Australia context (I can’t speak for the others’ motivations!). I think that the local context in NZ/OZ is slightly different than in the Northern hemisphere and there are some things that differentiate this region. Perhaps we can/should capitalise on that. For example, you will never see a ‘Research Works Act’ bill here, because we don’t seem to have Open Access mandates. Instead, we have NZGOAL and AUSGOAL which are frameworks for data licencing. The Australians have ANDS and NZ has eResearch, all focused on the data. Tim O’Reilly mentioned the PantonPrinciples in this context – but the Panton Principles (which I have personally endoresed) cannot be exported ‘as is’ to Australia and New Zealand because neither Creative Commons Aotearoa–New Zealand nor CC–Australiahave CC0, for example. Software hopefully will not be covered by patents is covered by copyright (not patents) in NZ*, so maybe we can capitalise on that to develop tools for open science. New Zealand has a Treaty of Waitangi, and any local open science needs to respect and work constructively to meet our treaty obligations. Lets add to that, that different research groups are going to be subject to obligations related to the international treaties their countries have signed up to. We all have different copyright restrictions and freedoms, we have different systems that determine how to assign funding, and different mandates and guidelines, and are at different points of our careers with different job securities. So, how do we make open science work within these diverse contexts? We can all agree on the philosophy, but perhaps we need to also agree that the implementation will take different shapes. I think wee need to continue the global conversation and continue to support each other, but we also need to start working locally in smaller groups to ‘make things happen’. And the battles we choose to fight perhaps should be aligned with local contexts so that we can each capitalise on our strengths. I loved having this dialogue at kiwi foo, getting great insights from a diverse group, and mainly feeling that this is something for which we have support. The rest of the things that happened at kiwi foo will slowly seep into future posts. I would really like to thank Jenine, Nat Torkington and Russell Brown for putting kiwi foo together (and inviting me! ), my partners in crime Alex, Nick, Alison, and Leonie for their hard work on the sessions, all the attendees for their contributions and especially Tim O’Reilly for providing us with valuable insights. You all have complicated my life, but I look forward to a 2012 of hard work and of ‘making things happen’. …to file my Annual Performance Review. Nothing makes me shiver as much as the Dean’s email reminding us that it is time to file our Annual Performance Reviews (APRs). This year shivering does not begin to express the feeling I got upon receiving that email. What have I achieved this year? ‘Nothing’ was the first thing that came to mind. This was followed by a profound state of panic! But wait, there is more…. Or so I thought until I realised I was looking for ‘measures of performance’ in the wrong places. So yes, the papers are still being written and haven’t been submitted, I haven’t attended any ‘scientific meeting’, I haven’t received any new grants. I could go on. But crises did not just ‘happen’. Mine came about because this has been a year in which my way of thinking and doing things has been challenged to its roots. Deep, deep roots. So perhaps, I have a lack of sense of achievement because I am looking in the wrong places. Sure. I didn’t go to any ‘scientific meetings’. But this is where I did go to: Science Online 201o, the Linux Conference, KiwiFoo, SciFoo, the Data Matters workshop, the eResearch conference. I also became an Academic Editor for PLoS ONE and became more engaged with the discussions about science on social networks like Twitter and FriendFeed. And I have to say, I learned more about ‘Science’ this year that in my entire career. And I was reminded not just of why I got into science in the first place, but also what kind of scientist I wanted to become. I also attended couple of workshops and conferences on innovative teaching, I completed my first year in a degree in education, became involved with WikiEducator, and was reminded not only why I got into teaching in the first place, but also what kind of teacher I wanted to become. I also became engaged with a variety of issues. From Public ACTA, and OpenLabour, to olpc and Creative Commons. And I was reminded of the kind of citizen I thought I was to become. I guess with great moral crises also comes great change. So I am actually looking forward to next year, when I hope that all the struggle of 2010 will pay off in the form of positive change and positive action. To all of you out there that gave me the chance to talk to you, who offered your ideas and listened to my ramblings, who helped me organize my thoughts, formulate my goals and provided me with guidance and support, my most sincere Thank You. #SciFoo: That was worth the trip! I was lucky enough to be invited to SciFoo this year, which proved to be a wonderful experience. SciFoo is an unconference organised by O’Reilly media, Nature and Google. It brings together a group of sciencey people to talk about science, and I cannot describe the level of awesome that I experienced while I was there. I went well-prepared: I had read the blogs of the attendees who blog, read their descriptions of themselves, contributed to the suggested sessions in the wiki, and showed up with a list of ‘must-meet’ people and ‘must attend’ sessions to make sure I made the most of it. But (and I learned that this happens after having attended 2 KiwiFoos), I might as well not done any of that homework. Because, apart from a couple of exceptions, I never got a chance to talk to the people on my list. Nor did I end up going to any of the sessions I thought I would go to. Instead, I found myself being pulled to ‘other’ people and ‘other’ sessions. And I guess that is the beauty of it all. Meeting people and hearing interesting things that were not necessarily on my radar. I started by attending two Lightning Talk sessions, moderated by Nat Torkington. Lightning talks are 5 minute presentations, which were great because it gave me the chance to hear about lots of different stuff and from very different people (which also explains why my original list ended up being useless). I was drawn to the third lightning talks session the next day. There I heard about the relationship between scientists and music from Eva Amsden, what we can learn about people by asking them how they played as children from Linda Stone, neuroscience and law from David Eagleman and many other mind tickling topics. Brain Machine Interfaces: I seem to have a fetish with BMIs, and the work of Miguel Nicolelis in this area changed the way that I think about the brain. So I couldn’t miss this one (especially since Nicolelis was there too!). I will be writing a bit more about this at a later time, but it is totally worth it to read about his research in his page. Most of all, I was seriously impressed with not only how far BMIs have gone, but how this kind of research is making us think about the brain in a very different way. Collaborative Science: This was fun, and I mean that in a literal way. Because among other things discussed, FoldIt came up. Yes, you can contribute to science by playing games. And in the process you end up being acknowledged as an author on a Nature paper. Blogging in a network: This session was led by John Dupuis, Carl Zimmer, Eva Amsen and Jonah Lehrer. Eva has a wonderful summary of this on her blog, so again, I will send you there. I went to many other interesting sessions and had amazing scattered chats with different people throughout SciFoo. It was great to see old friends and acquaintances, and make new connections. But one thing I learned at Kiwi Foo, is that as amazing as the few days of the event are, what is really more amazing is what happens ‘between’ Foos. There is a whole year ahead, and I can’t wait to see what comes out of it.